Taipei, Taiwan －May 21st , 2018－Thermaltake the industry leader in computer and gaming hardware innovation, together with premium product brand – TT Premium, professional gaming gear brand Thermaltake Gaming – Tt eSPORTS and Thermaltake Mobile – LUXA2 will be unveiling the latest tech masterpiece at COMPUTEX Taipei 2018, during June 5th (Tue) – June 9th (Sat) 2018 in TWTC Nangang Exhibition Hall (4th floor, booth number M0120). This year Thermaltake’s focus for COMPUTEX revolves around the latest industry trends of AI (Artificial Intelligence) and Sync Technology. Visitors will be given a demonstration with the TT RGB PLUS Ecosystem and TT AI Voice Control; supporting Android and iOS mobile devices and the Amazon Alexa smart speaker. 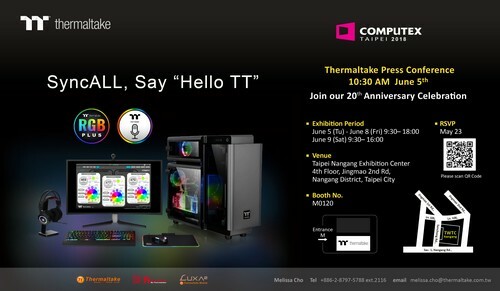 Therefore, Thermaltake’s marketing idea at COMPUTEX is SyncALL, Say “Hello TT”. With the AI technology and patented TT RGB PLUS Software developed by Thermaltake, all Thermaltake RGB products can be synchronized together and voice controlled by saying “Hello TT”. To celebrate the upcoming 20th Anniversary, Thermaltake will be launching the new Level 20 and brand new Level 20 GT Full Tower Chassis. Other stunning products to be showcased include the Riing Trio 12 RGB Radiator Fan TT Premium Edition, the Pacific CL and Pacific M Radiator liquid cooling series, Toughpower GX1 Gold power supply Series, Toughpower Grand RGB Gold power supply series (Sync Edition), and many more. In terms of gaming gear, the TT Premium X1 RGB Cherry MX gaming keyboard, Tt eSPORTS NEMESIS Switch RGB gaming mouse, Tt eSPORTS Iris Optical RGB gaming mouse, SHOCK PRO RGB 7.1 gaming headset, and DRACONEM RGB Touch ID gaming mouse pad will be displayed. Twelve world-renowned modders from the Thermaltake CaseMOD Invitationals will also arrive at the COMPUTEX booth to debut their stunning casemod pieces. Please check our Thermaltake YouTube Channel and Facebook Page for modder interviews and product demonstrations! Thermaltake will showcase the latest lineup of computer hardware at COMPUTEX Taipei 2018 and unveil the PC cooling innovation with artificial intelligence (AI) technology. A live demonstration of TT RGB PLUS Ecosystem with TT AI Voice Control will be displayed at the booth. Also shown for the first time is the upcoming member of the TT RGB PLUS sync-able products with triple 16.8 million-color LED rings – Riing Trio 12 RGB Radiator Fan TT Premium Edition. Other products at the show include: the long-awaited Level 20 Full-Tower Chassis Series, the newest flagship case family designed for celebrating Thermaltake’s 20th anniversary; Pacific CL Series, high-quality copper radiators made for 120mm and 140mm high-static pressure fans; Pacific M Series, all new D5 hard tube water cooling kits crafted for high-performance water-cooled gaming systems; Toughpower GX1 Gold Series, analog power supply units with capacities ranging from 500W to 700W and the application of 120mm fluid dynamic bearing fan; Toughpower Grand RGB Gold Series (RGB Sync Edition), analog power supply units with a patented 256-color 140mm RGB fan that is controlled via ASUS/GIGABYTE/MSI motherboard RGB software; and Toughpower iRGB PLUS Gold Series – TT Premium Edition, digital power supply units with a patented 16.8 million-color 140mm RGB fan and support for three of Thermaltake’s intelligent platforms – New DPS G PC APP 3.0, DPS G Smart Power Management (SPM) Cloud 1.0, and DPS G Mobile APP 1.0. 12 world’s top modders will also attend COMPUTEX Taipei 2018 with their latest modding projects. Thermaltake Gaming Tt eSPORTS, the leading expert in professional eSports gaming peripherals is excited to announce attendance at COMPUTEX 2018 with new and exciting gaming gears. In the keyboard category, visitors will be treated to the stunning TT Premium X1 RGB Cherry MX gaming keyboard that comes with SyncAll compatibility with TT RGB Sync Thermaltake power and liquid cooling solutions for seamless color coordination of your gaming ecosystem. In addition to this, the exclusive X1 RGB app that features an innovative AI Voice Control and patented designed Virtual Game Controller function, equips enthusiasts with almost unlimited possibilities. The mouse category features the NEMESIS Switch RGB gaming mouse with Exclusive Patented Design Key Switch Control System, 16.8 million RGB color illumination, 16 programmable buttons, and 12 switch key options for a truly enhanced FPS/MOBA/MMO/RTS gaming experience. Visitors will also be able to see firsthand the new budget friendly IRIS Optical RGB gaming mouse, packed with amazing features, 16.8 million RGB color, and stunning aura illumination. The headset category will see the release of the new SHOCK PRO RGB 7.1 gaming headset that now includes stunning premium 7.1 surround sound. Finally, in the mouse pad category, the DRACONEM RGB Touch ID gaming mouse pad is introduced, and is equipped with the latest biometric fingerprint technology for safe and secure login. As a market leader in power, audio and holder solutions, LUXA2 will once again be attending the highly anticipated COMPUTEX 2018 with iconic award winning power, audio and holder solutions. In the power category, enthusiasts will be treated to the new EnerG Bar Notebook Power Series lineup, designed to provide a truly lightweight and portable power solution for your notebook devices whilst on-the-go. In the audio category, visitors can feast their eyes upon award winning wireless solutions catered to sporting enthusiasts that seek true wireless freedom during their all-important workout. Finally, in the holder category guests will see firsthand the iconic E-One Aluminum Headset Holder collection - available in 4 stunning colors: silver, stealth black, champagne gold, and blush rose gold.